In late 2012 we started to publish “Zines” – publications that can be produced cheap and fast. Just like building on the spot, “Zines” can be used as effective tools to making the dialogue about space more concrete and visible. We want to start producing “Zines” much earlier in the process – rather than producing long reports, like we did in 2012, that often go unread. 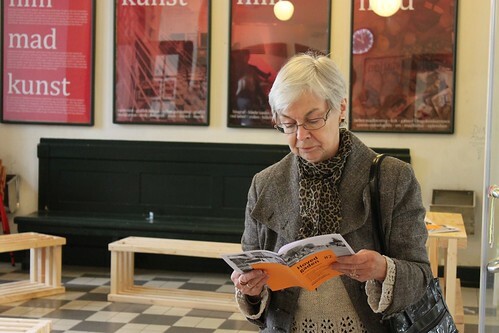 In this case we produced two issues of a new local magazine – Hovedgaden (The Main Street), edited and produced by local people with the help of some students. Instead of stapling we got an old sewing machine and sewed them together. Posted on February 16, 2013 March 9, 2013 by jensbrandtTagged Communication, Media, Publication, Spatialising the dialogue, Students, Zines.